The Autowatch 375 CLAM alarm is identical to the Thatcham approved version except that it comes with a standard neodymium siren and the keypad is offered as an optional extra. The Autowatch 457RLi/T is a comprehensive remote alarm immobiliser security system offering maximum security and all the comfort features a customer would ever require, with ease of operation being one of its key selling features. And the ability to use up to 6 wireless sensors (PIR &/or Reed switch). Approval No TC2 1404/0807. LCV Approval No TCL1 147/0807. Thatcham category 1. The Autowatch 458RL/T remote alarm system has all the features and facilities of the Autowatch 457Rli/T CAT 1 system except that it does not have immobilisation. Approval No TU2 1405/0807. LCV Approval No TUL1 148/0807. Thatcham category 2-1. 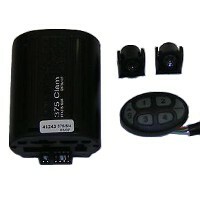 The Autowatch 375 Central Locking Alarm Module [CLAM] can be fitted to all new vehicles that require an alarm. The system is designed to operate with the car's original remote control. This means that the alarm will automatically arm and disarm with the vehicle's keyless entry remote, so no additional remote is needed for the alarm. The system includes an illuminated keypad offering additional security and convenience features as well as anti-car key theft option. Thatcham category 2-1. Approval No: TU2 1313/0504. LCV Approval No: TUL1 116/0704. This is the ideal choice for the customer who wants a full featured security system, remote keyless entry and does not require a Thatcham Caterory 1 approved system. The 346RLi-Blue system includes a vivid blue dash-mount warning LED (alarm status light) and blue LEDs in both the miniature two button remotes.The 346RLi-Blue has full on-board locking and immobilisation, with a useful anti-key theft option. The Standard 346RLi-Red provides the same security/convenience features as its sister model the 346RLi-Blue. The only differences are that it is supplied as a perimeter alarm to provide for flexibility and individual choice of a sensor. This system is also supplied with traditional red LED s in the remote transmitters and in the dash-mounted warning LED [Alarm Status Light].